“I love being home with you,” I told the dog, when everyone I knew was out somewhere having fun, and I was feeling antsy with nowhere to go. “But now let’s find something beautiful and joyful to photograph. Something besides you,” I said, and followed her flickering tail around the pond, stopping to take pictures of the water and wildflowers. A colossal pink cloud floated overhead. I snapped a dozen shots of it, awed by its rosiness. The cloud would be a perfect illustration of joy, I thought. After weeks of watching the garden dry up in the drought, after howling my grief songs and driving people mad trying to move boulders, I desperately wanted to blog about something joyful. So that night I stayed up late, turned on the TV, made popcorn, poured a glass of sherry, pulled over a cozy chair for the dog, and began playing with the image of the pink cloud. And over the weekend, I missed a picnic and passed on a dinner invitation, as I Photo-shopped the cloud in the water, in my face, around a lone girl. I Photo-shopped the heck out of that cloud. I looked at the picture I’d spent hours composing. I looked at the dog. And then I had to consider that maybe I’m the one walking around with my head in a pink cloud, convinced I’m solidly planted on a sure path to healing. This entry was posted in 2016 and tagged delusional, euphoria, flight from reality, grief, head in the clouds. 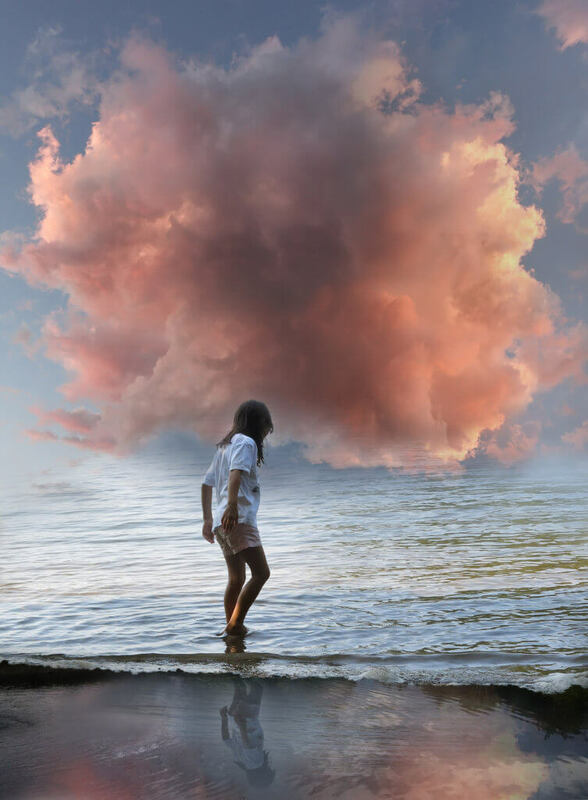 healing, lone girl, looking for joy, path to recovery, Photoshop, pink cloud on 2016/08/08 by Robin Botie. Please don’t judge yourself harshly, Robin. I love your pink cloud and everything about the image. I feel her tentative step into the great watery unconscious where we’ve been swimming for years. I need pink clouds to balance the dark gray looming gloomy clouds in live. For me, the trick of living with grief is finding a still point between the two poles. I think you’re doing just fine. And grief is a hard unending ride. Might we also consider that sometimes convincing ourselves is our survival instinct keeping us moving forward or alongside the grief until, hopefully, at some point, more joy becomes our reality? I love this photo, Robin. It immediately drew me in and held me there. I agree, Monica. Actually I think it’s all about convincing ourselves. Isn’t that what faith is after all? And “joy becoming our reality” – well, that’s the best religion I can think of. Sometimes a flight from reality is just what we need, Robin! Love your photo! Thanks, Lynne. Actually, I need to take a more adventurous flight from reality one of these days. I’m not quite at your level of abstraction but must try. Soon. Need to. A magnificent photo, Robin! One of your best. Many thanks, Annette. I hope you like this next one. And hugs for all your help.